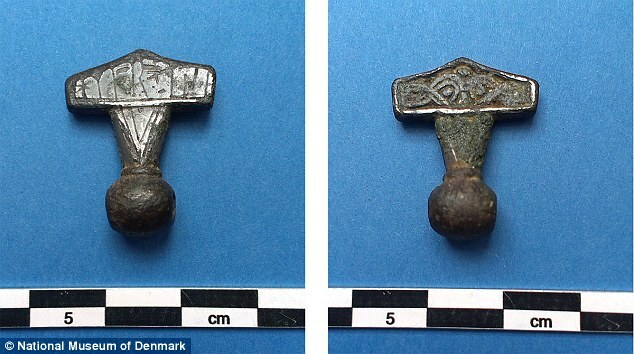 The discovery of this unique piece was made by Torben Christjansen, an amateur archaeologist, using a metal detector. In Denmark, the use of metal detectors to search for antiques is legal, although each artifact found should be handed over to the National Museum, which determines its origin, authenticity and eventually awards it to the discoverer. “There is a very close collaboration between museums and amateur archaeologists. We benefit from their work, “says Henrik Schilling, public relations officer of the museum, where the discovered piece is being analyzed, becoming a part of the museum’s collection afterward. Researcher Lisbeth Imer from the National Museum of Denmark was in charge of translating the inscription “Hmar x is.” In a statement from the institution, the specialist describes the discovery as unique and says she has no doubts over the words which are meant to say “hammer,” but points towards the fact that the inscription was misspelled. The author of the inscription missed the first vowel of the word hammer,” she said, arguing that this omission could be for reasons of space. Nevertheless, everyone is grateful to the mysterious author of the inscription as it made it possible to finally clarify doubts that researchers had in the past regarding Thor’s hammer.